Hue, Viet Nam Hue has taken the GrEEEn Cities approach to urban planning envisioned by ADB. 'Livability' is seemingly a very simple word and a straightforward concept but one that seems a distant dream for those in many Asian cities. The first step in distilling its meaning is to understand what matters to us as citizens. The need for clean air, clean water, and uncontaminated land– for growing food, for work and play – a space to bring up a family, are the basic factors for livability. 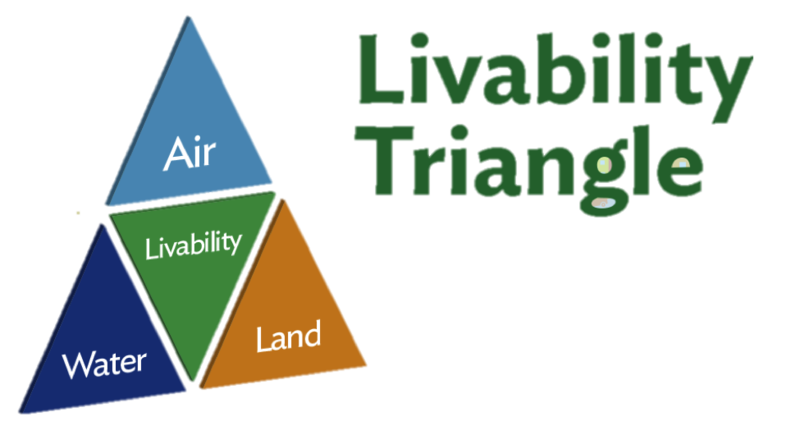 We articulated these simply as the Livability Triangle. Supplementing these basic needs are quality of life factors like economic prospects, growth opportunities, access to amenities, infrastructure, and social services as well as their efficiency and quality. Nevertheless, livability remains elusive, being defined differently by people in different places at different times. The challenge as a planner, an engineer, or a city manager is to articulate the meaning of livability for citizens – such that it translates to a 'vision' that aligns with their aspirations of a place where they would like to live or come back to time and again. The challenge for city managers, engineers, and planners is therefore two-fold. First, we need to respond quickly and comprehensively to the needs of citizens with effective solutions in the face of rapid urbanization and a degrading environment that will eventually undermine both quality of life and the sustainability of city investments. The second challenge—and greater one, given a city’s limited resource envelope—is to strike an optimal balance between the three dimensions of sustainability: economy, environment, and equity. These issues have formed the basis of a rethink on the response to the demand from cities in Southeast Asia to integrate green growth strategies for urban development to enable cities to move from the status quo toward livability. The solution is to balance and bridge natural resource consumption and land use planning through comprehensive management of the city’s natural infrastructure, cultural, and human resource assets to improve sustainability and resilience. In parallel, we need to be meticulous in identifying the community and understanding their environmental, social, and economic fabric to chart a road map to eventually provide them the city to which they aspire. Assess the state of the elements simply, as defined by the “livability triangle”. ‘Do not re-invent the wheel.’ See what has been done before and add to it since we rarely build a city from scratch. Listen to citizens by regularly communicating on issues that directly or indirectly affect the quality of life of citizens given that cities continue to grow at unprecedented rates and people continue to migrate to cities seeking better opportunities. Generate a common vision for the city with a deep understanding of all stakeholders, to map and analyze their needs. This will create ownership of the citizens for the assets they will create. Deepen the understanding of institutional dynamics for accountability and decision-making within the city. This will strengthen institutional effectiveness and ensure sustainability of investments. We are applying all this through the GrEEEn Cities Operational Framework to develop GrEEEn City Action Plans which balance the ‘3 Es’ dimensions of sustainability (economy, environment and equity) and create a platform for citizen engagement and consensus building for a shared vision that leads to a strategic combination of investment initiatives and programs to optimize value-for-money. Transforming urban spaces into livable cities is a long-term commitment jointly embarked on by all stakeholders taking one step at a time and consolidating initiatives. By going through this process, Asia's city dwellers and managers can together create livable, sustainable, and resilient cities that they have been part of building and in which they are proud to live.